Balmer Lawrie’s current focus is to enhance its triple bottom line year on year. 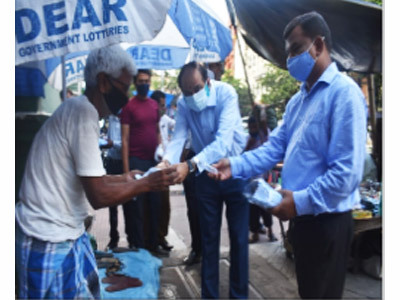 In line with this, the Company has been driving various corporate social responsibility projects independently around its units and establishments across the country and has also been supporting various programs initiated by the Government of India like the Clean India Mission and Skill Development Institutes. The Company believes in achieving higher socio-economic goals and in pursuance of this belief, it is committed to conducting its business in a socially responsible manner and be responsive to the needs of the society at large. The various CSR initiatives pursued by the Company since the last few decades are aligned with the overall objective of driving sustainable development and growth for its stakeholders. 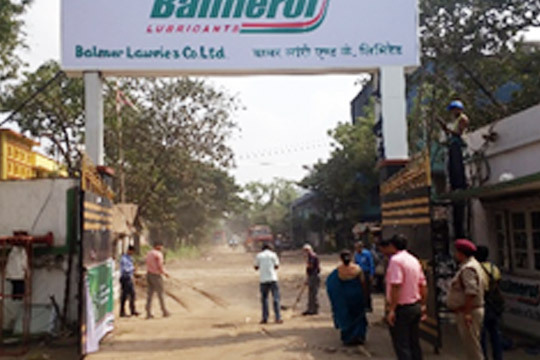 Balmer Lawrie’s CSR initiatives are driven by two Flagship Programs - Balmer Lawrie Initiative for Self Sustenance [BLISS] and Samaj Mein Balmer Lawrie [SAMBAL]. While the first Program is directed at providing and improving the long term economic sustenance of the underprivileged, the second Program aims at improving the living standards and quality of life of population in and around the Company’s work-centers. In pursuance of these Programs, the Company has undertaken several community development projects, partnering with various NGOs with a focus to trigger development at micro-communities and thereby generate the desired developmental impact. 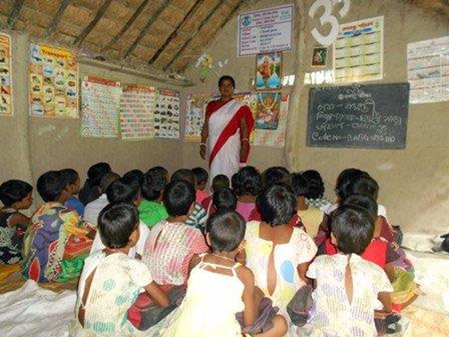 The focus areas for the Schemes under the Programs, amongst others, have been on education, healthcare, sanitation, shelter, integrated village development, employment generation, vocational training leading to employability & livelihood, rehabilitation of the destitute, disaster mitigation, and environmental protection. CSR efforts are channelized on the above mentioned thematic focus areas and target groups like children, women, youth, elderly and differently abled people. Through the various CSR programs, the Company has constantly endeavored to integrate the interest of the business with that of the communities that form part of the areas it operates. In keeping with Department of Public Enterprises [DPE] guidelines on CSR, the Company has formulated a CSR Policy and Long Term Perspective Plan. In order to facilitate companywide implementation of our CSR policy and ensure that CSR is embedded across various business units and their operations, a CSR governance structure has been put in place. With the advent of the various flagship programs launched by the government, we as an organisation take pride in furthering the initiatives which comes under the purview of CSR by engaging specialized agencies, and in keeping with the DPE guidelines, the Companies Act 2013 and Schedule VII of the Companies Act. A total sum of Rs. 438.00 Lakhs was spent during the year 2017-18, towards CSR activities, including expenses towards promotion and publicity of the schemes and other related expenses. The following activities / initiatives were undertaken during the year under report, i.e. FY 2017-18. 1. 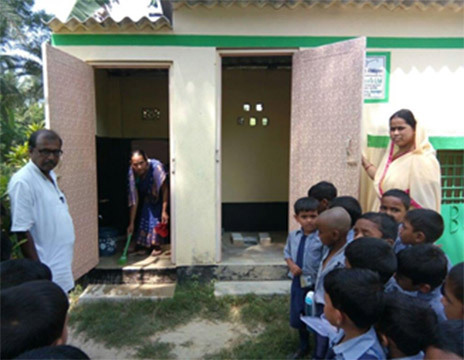 Under the Swachh Vidyalaya : Swachh Bharat Abhiyan, toilets were constructed in the states of West Bengal, Assam, Andhra Pradesh, Chhattisgarh and Haryana for the students of primary government schools to avail facilities of toilets. It was committed by Balmer Lawrie to maintain the toilets at least for 5 years. Therefore, our Company is maintaining the toilets as per need in West Bengal, Andhra Pradesh and Haryana. Taking a step ahead our Company also refurbished/repaired the toilets which have been used for last 3 years from the date of commencement. 2. Balmer Lawrie sponsored the construction of a toilet block in Chatrapati Shivaji Vidyalaya, Palaspe, Panvel, which was inaugurated on 21st August 2017 by Mr. Prabal Basu, C&MD, Balmer Lawrie and Mr. Thakur, MLA, District in the presence of Balmer Lawrie Directors and other dignitaries. 3. A toilet block for tribal boys and girls was constructed at Chavane Village, Maharashtra. 4. A total number of 25 toilets were constructed in the government schools and hospital at Bhavi and Kedhapa in Rajasthan. 5. 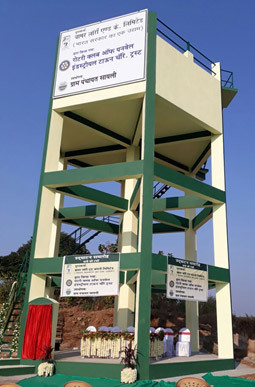 Balmer Lawrie sponsored the construction of two community/public toilets at Panvel in Maharashtra and Anand Vihar in New Delhi. 1. The Balmer Lawrie sponsored Mobile Health Van run by Helpage India at Manali, Chennai to provide medical care especially for the elderly people, caters to 12000 patients annually. 2. The Balmer Lawrie sponsored Mobile Health Van run by Helpage India at Manali, Chennai to provide medical care especially for the elderly people, caters to 12000 patients annually. 3. 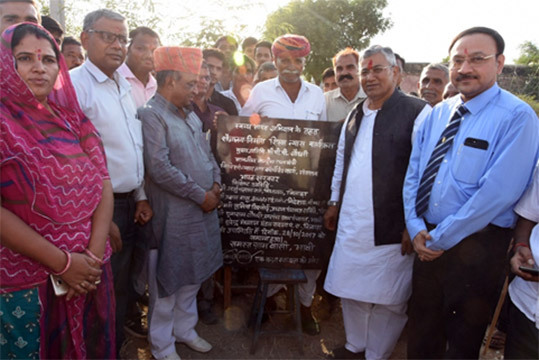 As part of the Swachh Bharat Abhiyan, Balmer Lawrie has adopted the Sayali village in Silvassa and has sponsored the construction of a water tank for providing clean drinking water to the villagers. This initiative has benefited 5000 villagers. 4. 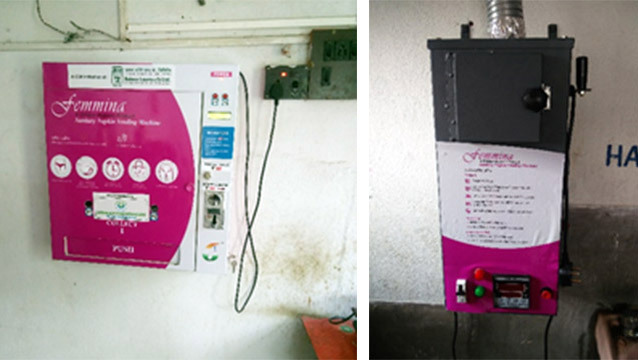 An incinerator and vending machine for sanitary napkins was installed in four government schools at Kolkata in West Bengal and behavioral training was carried out for the adolescent children and their parents. Skill Development Institutes (SDI) are being set up at various places in the country by the member companies of the Ministry of Petroleum and Natural Gas (MOPNG), Govt. of India. As a member Company, Balmer Lawrie contributed Rs 150 Lakhs for the institutes coming up at Guwahati and Rae Bareilly and fully operational SDI at Bhubaneswar and Vishakhapatnam. Some of them have started the courses on skill development. 2. Two classrooms are being sponsored under the “Corporate Leverage and Support Scheme” (CLASS) of Indian Institute of Cerebral Palsy (IICP) for supporting the differently abled, particularly children suffering from cerebral palsy. In all 30 children are being supported. Balmer Lawrie also supported IICP in their fund raising for the charity Golf Tournament - “Hope Cup” held in Kolkata in January 2018. 3. Our Company extended support to projects focused on the upliftment of the tribal students, run by Friends of Tribal Society known as EKAL Vidyalayas. Balmer Lawrie sponsored Rs. 10 lakhs for these vidyalayas catering to the tribal populace. 1. As part of the Swachh Bharat Abhiyan, Swachh Bharat Pakhwada was observed from 16th to 31st December 2017. 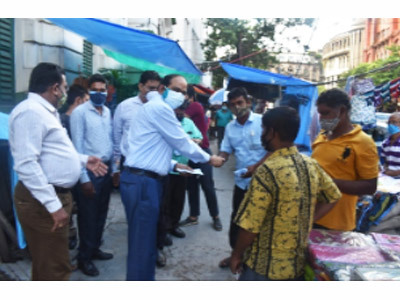 Cleanliness drives were organised across units and establishments, the swachhta pledge was administered in some units and various programs were organised across locations to generate awareness. On 28th December, a medical camp for scavenging workers of Chennai Corporation, Manali region was organised by our Company. 150 workers benefitted from the camp which had the provision for testing hemoglobin, blood grouping and typing, random blood sugar, blood cholesterol, blood creatinine, total blood count, blood differential count, urine albumin, urine deposits, urine sugar, Hepatitis B, TB and cervical cancer. General check-up by the physician was also carried out. A medical camp was also organised at Silvassa for the house keeping staff. 2. 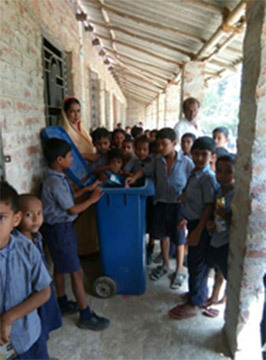 Balmer Lawrie joined the ‘Swachhta hi Seva’ movement and organized various cleanliness activities not only in its units and establishments but also in the schools and villages near its factories. Various activities were organized like the Swachh Karyasthal contest, Essay and Drawing competitions for school students, cleanliness drives, Swachhta awareness sessions, distribution of dustbins, personal hygiene sessions for girl students and distribution of sanitary napkins. 3. 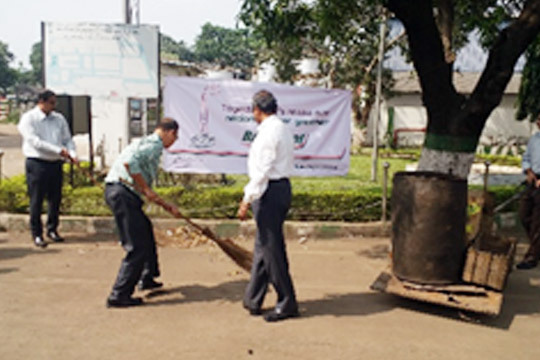 Department of Scientific and Industrial Research (DSIR) under Ministry of Science & Technology observed Swachhta Pakhwada as part of the Swachh Bharat Mission between 1st and 15th November, 2017. Our Application Research Laboratory (ARL) at G&L – Kolkata, being a DSIR recognized R&D Unit since November 1981, observed the Swachhta Pakhwada during the same period. 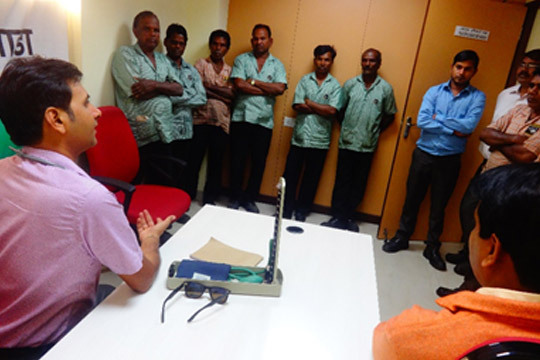 Various activities like cleaning of the factory premises, plantation of saplings, extempore speeches by employees, quiz contests and awareness programs were organised to reinforce the significance of cleanliness at the workplace.